Before I begin my 365, I really have to say thank you for the boat load of comments, emails, facebook encouragement and Instagram love in regard to my previous post. I was confident that I could trust this little community with my story and once again you have proved to be an amazing support system in our family's life. Adrain and I poured over each of your many comments and encouragements and even recommendations. I'm exhausted from this week so though I want to respond to every single one of you, I've got to say a collective thank you... but please know we read every single word from every one of you-a couple of times! We love you guys. I can hardly believe this month has come and gone. It hit like a whirlwind. This month it was difficult to get my photo a day... and I decided after two straight years of 365 photos I'm going to take a break on January 1st. I may do a hit or miss monthly recap. We'll see. Today I'm adding hashtags to a few of these just for my man. It's a bit of an inside joke so bear with me for using my blog to make him laugh. That said, I love my little pilgrim garland from my bloggy friend Alicia. It's a very treasured decoration. I ended up hanging it in about five places throughout the month. #Loveitsomuch!! I get to look into these baby blues every day. #howluckyami? Falling leaves. Such a pretty display of color. Ava made herself a little wire ring. #Etsyhereshecomes! Finishing up the last of my Etsy items... and now my store is sold out for the holiday season. #imonvacation! Yes my son does wear this shirt almost daily. It's lined with fleece and he's big on textures. Adrain caught this shot of Daisy taking a little nap on the floor next to him. Precious. Preparing for guests, big batch of pumpkin pie fudge in little takeout boxes. Because everyone loves a take home gift, right? My man teases me... my love language is gifts. Anniversary weekend kickoff. I admit it... I couldn't pass up the cute label. Day date! We were blessed enough to have a few hours to ourselves (no kids!) 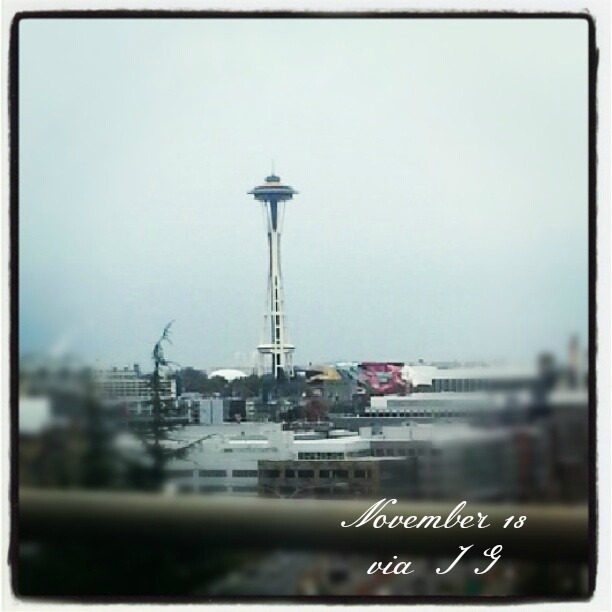 and went to lunch in Seattle to celebrate 17 years of marriage. I was afraid to try this pie. But my mom-in-law bravely took the first bite and declared it was GOO-OOD... then the wolves descended and my man was only left with one slice for leftovers. Ha! 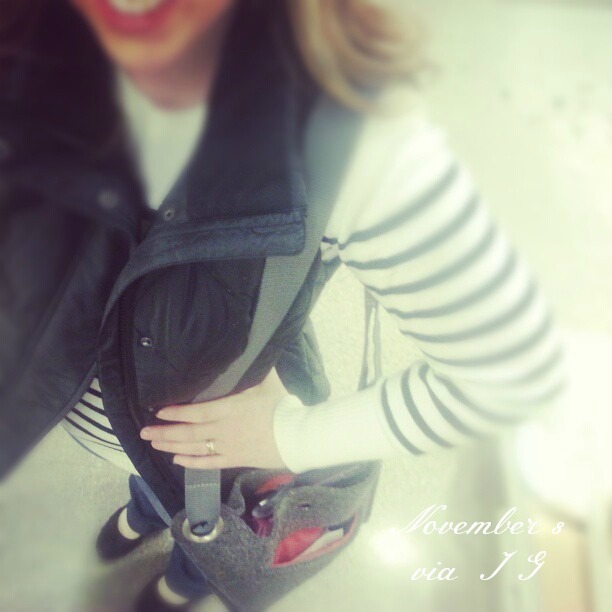 So... how was your November?! Many years ago, we were going through occupational therapy for sensory issues with our son. I will never forget what the OT said to me about the holidays. She reminded me that there is more stimulus in the six week period surrounding Christmas and New Years, than at any other time of the year and it hits you in sight, smell, hearing, taste and even touch. It's a sensory overload crazy time! She explained to me how much additional stress it puts on a person to be on overload like that for extended time periods. When you think about it, it's certainly a good point. It's not even December first yet, and the radio is already blaring the same seven Christmas songs at me... I've got five lists going as I speak and a million things to do before I can sit down and rest...my inbox is swollen with offers and ways to spend up all the money we will ever make... Commercials are promising ways to lose those pounds we're all certainly about to gain from the overflowing grocery shelves... cinnamon scented pine cones are giving us headaches when we walk into the craft stores, and the word "perfection" is being bandied about like a volleyball. "How to make the perfect pie" "Make the perfect wreath" "Host the perfect party" "Give yourself the perfect manicure"... it goes on and on. All I can think about is how I just want some peace. I want to sit and read Christmas stories to my kiddos in the evening without having to rush all over the city checking boxes on a to do list. 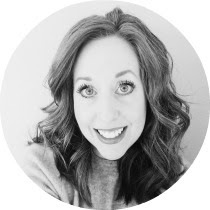 I want to focus on the reason for the season, rather than forcing myself to decorate perfectly... bake perfectly... blog perfectly... look perfectly, blah, blah, blah. It was sure easier when we were kids. I don't know why I have to write the word "rest" on my to do list to remind myself to work it in... It doesn't come naturally for me! I don't sit down, I get things done. And that's not bad all the time... but we were created to need rest every so often. If you don't get enough of it, you'll get weary... and weary people get discouraged, cranky and bitter. I imagine we need extra doses of it this time of year when our senses are overloaded. So I suppose the moral of my story is: if you want peace you may have to schedule it in during this season, especially if you're like me and you don't naturally know how to chill. Let's turn off our radios every so often. Say no to the obligations pressing our shoulders. Make a cup of tea with a loved one and sip it slowly. Let ourselves be open to quiet, rather than filling it with noise and chaos. And perhaps, in the peace of that simplicity, the true meaning of CHRISTmas will soothe our weary souls. How about you... what do you do for peace during this season? I would love to read your thoughts. 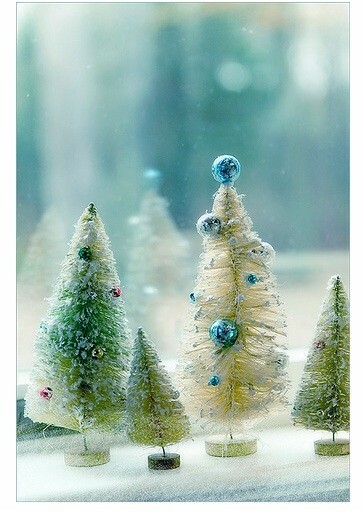 I'm nearly done tweaking my decor for the holidays, but today I wanted to share some inspirational photos plucked from Pinterest. We are about to begin celebrating advent each Sunday as a family and I wanted a simple idea for an advent candle. 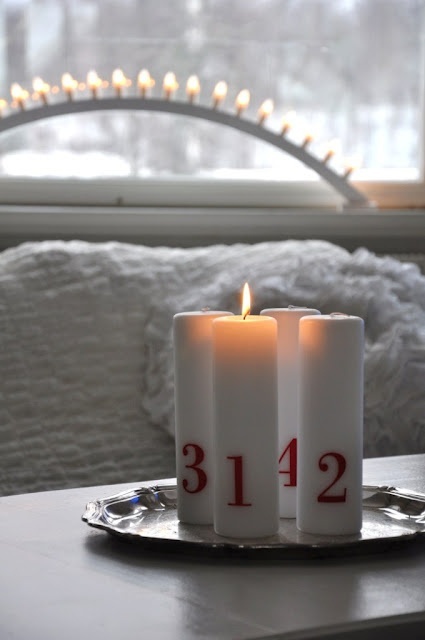 When I found this plate of candles with numbers I knew they were perfect! But here's where I confess something... and this very well may change your opinion of me after this... here goes. I'm not generally a huge fan of the color red at Christmas time. I know right?! I must be crazy. I should be... I want to be... and I even own some darling red items! In my defense, I think I'm just a little bit red-ed out. I grew up in a house with a bright red and white kitchen... and as a new mom my house was bathed in the color. My walls were painted red, and my sofa pillows and slip covers all splashed red around so when Christmas comes I find myself side-stepping the color red. (Again... I know... it's weird.) Anyway... I found huge black number stickers at at Lowe's in the house number section and bought four. I think I spent two dollars in all. I adhered them to four plain candles and there ya go. Advent done. 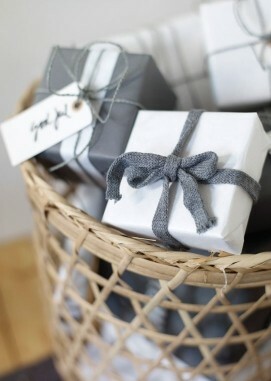 I fell a little bit in love with this gray and white wrapping color scheme. (Probably because it wasn't red. Ha!) I tweaked mine a bit and used a lot of brown wrap with gray ribbon as an alternative since I wasn't able to find gray wrapping paper. I might be obsessed about the cuteness of bottle brush trees. I don't know why but I adore them to pieces... only I haven't been able to locate any actual vintage ones. I made a few myself using stuff I already had on hand and they are very sweet. Not the real thing... but super close. Anything in a bucket. 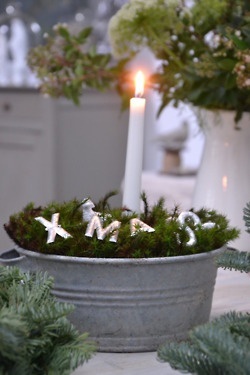 I have three trees in old buckets sprinkled around the house this year. Two tiny ones and of course, our big tree. Our big tree sits in a shiny, inexpensive bucket from Lowes... so I hit it with some hammered metal spray paint last season and it took that tacky shine off. Much better! Vintage ornaments... I love the colors so much! 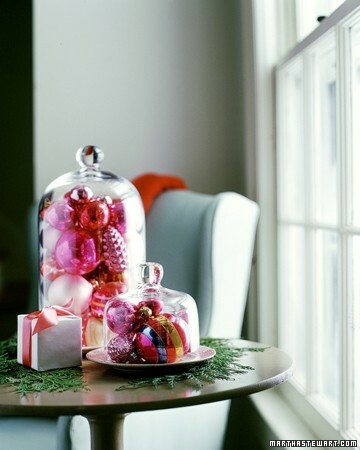 Bright, happy pops of non-traditional holiday color. Speaking of bright happy color... these are everywhere right now and I LOVE them. Felted ball garlands. I watched a ton of tutorials on how to make them and in the end I splurged and purchased one from Etsy because 1) It's good to support handmade and 2) I was overwhelmed and decided it was too difficult of a craft for me at the time. ( I was hand stamping 200 Christmas garlands for orders at the time.) 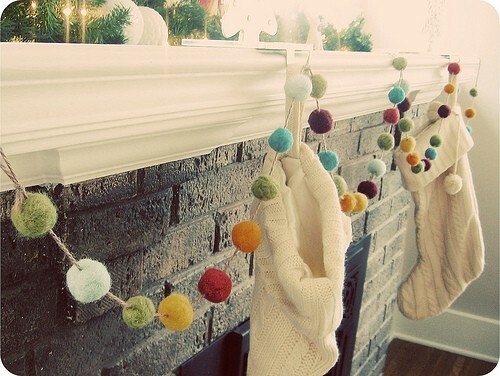 I want a few more of these felted ball garlands. I feel the need to drape everything in them! Ha! What has inspired your holiday decor?